Most of us running our inboard/outboards (I/Os) and inboards in salt or brackish water understand the potential harm that water can afflict on our expensive machinery. Corroded and leaking manifolds and risers, blocked cooling passages and overheating engines, to name just a few of the hazards. One partial solution is a fresh water cooling system, where outside water is used to cool the engine antifreeze in a heat exchanger. This will help eliminate the ill effects in the engine block, but the raw water side of the cooling system is still vulnerable to salt and corrosion. 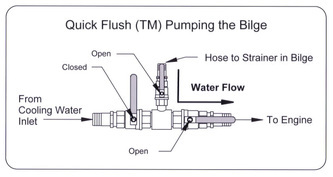 Another, better, option is to install a fresh water flushing system in your boat. Such a system allows the engine to be flushed with fresh water after you have returned to your slip. Most of these units have to be added after purchase of the boat and vary widely in concept and execution of the product. Most of theses aftermarket systems contain a single valve, allowing only an engine flush option. One design requires replacing an existing seacock or adding a specific type seacock/thru hull. Yet, others are constructed of plastic parts and valve components. 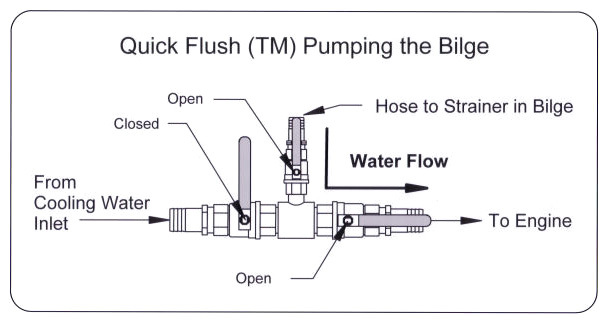 However, one new-to-the-marketplace system that is catching on with local (as well as national) boaters is the Quick Flush (TM) Flush Valve kit from Marine Technology Group, LLC. This engine flush system consists of three ball valves mounted on a bronze (now C46-400 marine brass) Tee-shaped central body. These ball valves are true marine valves. They have bronze bodies (now C46-400 marine brass) with stainless steel balls and Teflon seals. Properly sized red-coated stainless steel handles allow easy operation. Like all marine ball valves, the handle position indicates whether the valve is open or closed. With the handle parallel to the hose, it’s open. With the handle at right angles to the hose, it’s closed. No ambiguity here. One leg of the Tee is for the inlet water from the seawater pickup on the outdrive or from the engine cooling inlet thru-hull. A second leg of the Tee is the outlet for the cooling water going to the engine. The third leg of the Tee is the inlet for the flushing water. 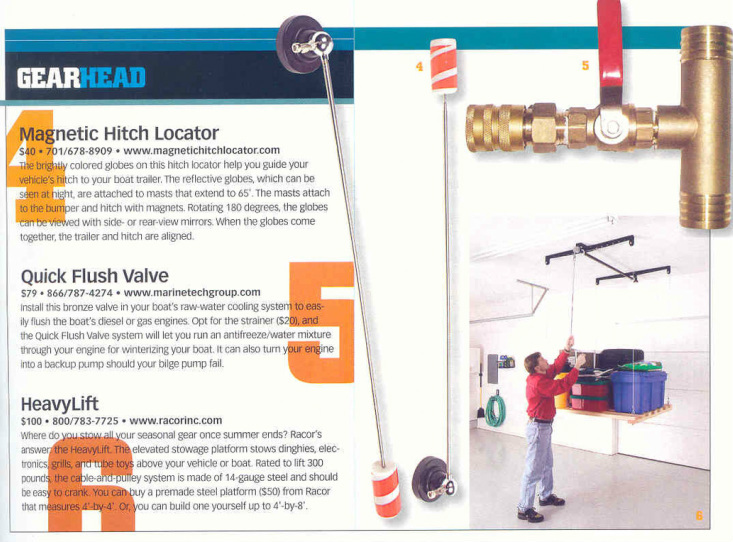 This connection is equipped with a quick release hose coupling, making the job of connecting the freshwater hose to the Quick Flush unit quick and simple. 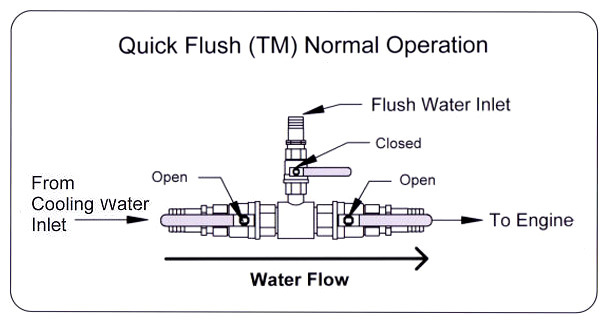 In normal operation the two main valves are open, allowing cooling water to flow from the seawater pickup to the engine, while the flush water inlet valve is closed. 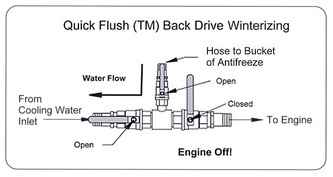 This maintains the flow of cooling water to the engine during normal operation. The large valve size eliminates any possibility of a restriction in the cooling flow. 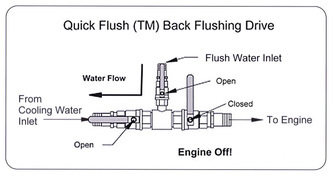 To flush the engine at the dock, the inlet valve from the seawater pickup is closed. 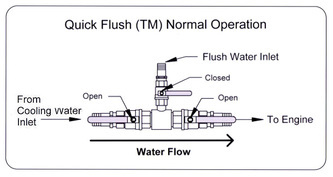 A standard garden hose is connected to the flush water inlet and the flush water inlet valve is opened. 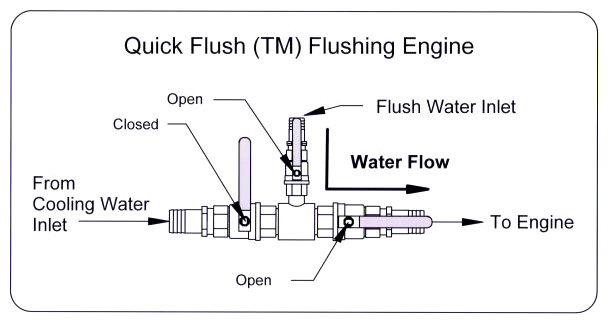 This allows the flushing water to flow into the engine and accomplish the task of flushing the engine. Up to this point the Quick Flush system is no different from other engine flush systems. Things change at this point, though. 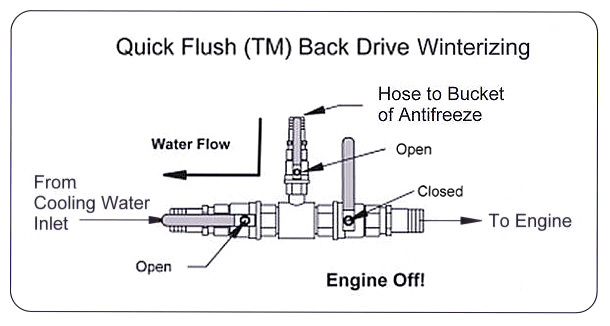 By closing the cooling water inlet to the engine while leaving the flush water inlet of the inlet from the sea water pickup open, you can back flush the outdrive. Of course, the engine must be shut down at this point, as there will be no cooling water flowing to the engine. 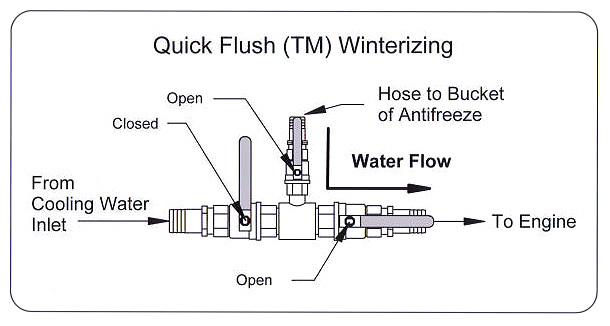 If you opt for the optional inlet hose and strainer, you can also use the Quick Flush system to make winterizing your boat engine a snap. The strainer and hose is connected to the flush water inlet port and then dropped into a bucket of antifreeze. When the engine is started, the antifreeze is sucked through the engine. Run the engine until antifreeze is being spit out the stern. The optional strainer and hose can also be used as an emergency bilge pump. This is accomplished by dropping the hose assembly down into the bilge and closing the valve from the seawater inlet. The water from the bilge is pumped through the engine as cooling water while draining the bilge. 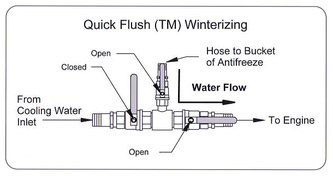 Installing the Quick Flush unit is very simple. If you have an engine with a cooling water inlet thru-hull, the hose from the thru hull is cut and the Quick Flush is inserted in the line and hose clamped. If you have an I/O engine, locate the cooling water line from the outdrive to the engine and insert the Quick Flush in that line. Tighten hose clamps and you are done. Three different Quick Flush versions are available: the Inboard-I/O model shown here, one designed for air conditioners and generators, and a third designed specifically for diesel engines. The second two options have slightly different vavle configurations to suit their specific application. Boaters who have installed these units swear by them. Engine flushing has become, for them, an easily accomplished task. Let’s face it, the easier a job is the more likely it will be done. 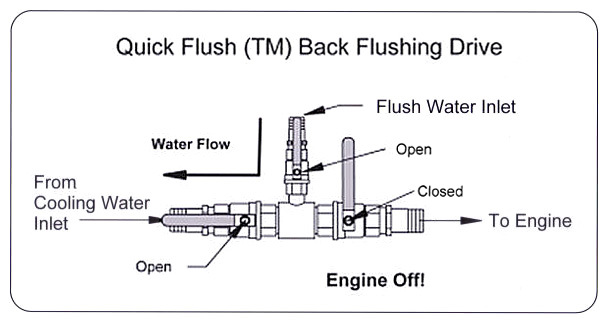 The bottom line is that installing a Quick Flush system will prolong the life of your engine which, considering the cost of a rebuild or repowering, make a Quick Flush installation a sound boating investment.